Check out this week’s must-see gigs, parties, events, and more! Why you should go: Aside from the ladies getting free drinks ALL NIGHT? There's also a buy 1 get 1 free on drinks from 9 to 11 p.m. 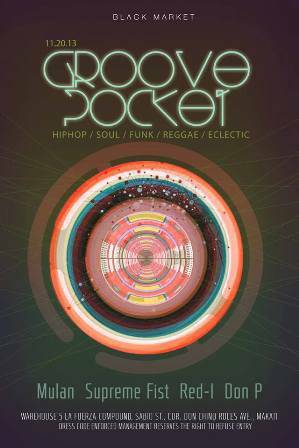 Enjoy your free drinks as you groove to music of Don P, Supreme Fist, Mulan, and Red-I. Why you should go: You know the drill, folks! This is the seventh in the series of free gigs that Radio Republic is hosting. 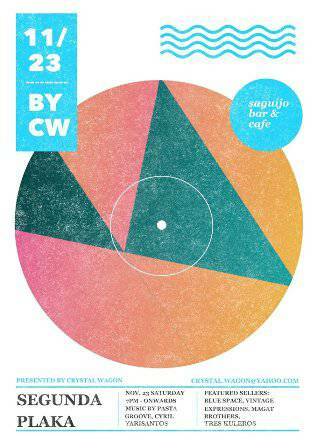 This time, Out of Body Special, Jeffrey Zulueta Experience, and Inky De Dios will be playing some soul-searching music. They are also accepting cash and in-kind donations for the victims of Yolanda. Other details: Instagig starts at 9 p.m. No entrance fee, just bring your donations! 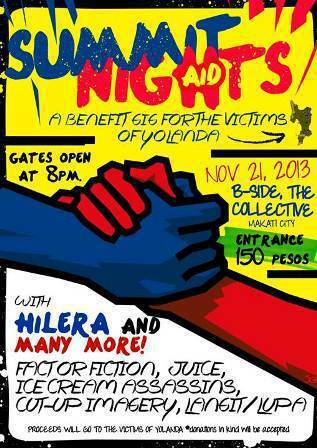 Why you should go: Over six bands, including Hilera, Factor Fiction, Juice, Cut-Up Imagery, Langit/Lupa, and more, will be playing to raise funds for the victims of Yolanda. Donations in-kind will also be accepted at the venue. Other details: Gig starts 8 p.m. P150 entrance fee. Why you should go: The best of international and local DJs band together for a cause! 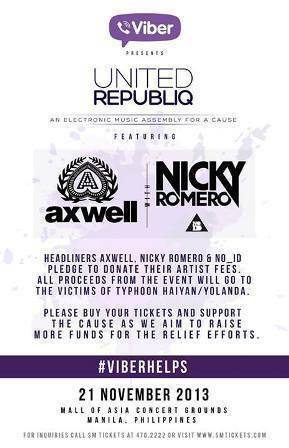 International EDM stars Axwell, Nicky Romero, and NO_ID will be donating their talent fees for the victims of Yolanda. DJ Ace Ramos, Marc Naval, Martin Pulgar, and Mars Miranda will also be joining in the fun. Other details: Gates open 8 p.m. For ticket inquiries and reservations, call 4702222 or visit any SM Tickets outlets. 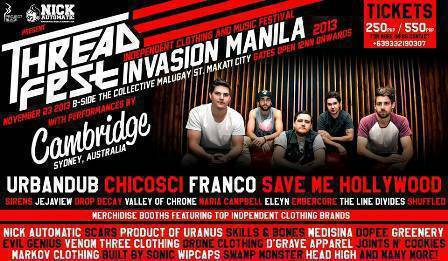 Why you should go: Cambridge from Sydney, Australia is dropping by the Philippines to jam with Urbandub, Chicosci, Franco, Save Me Hollywood, and more! The venue will also hold merchandise booths featuring top independent clothing brands. Why you should go: If going to gigs and parties isn't your thing, then why not go to this film festival instead? 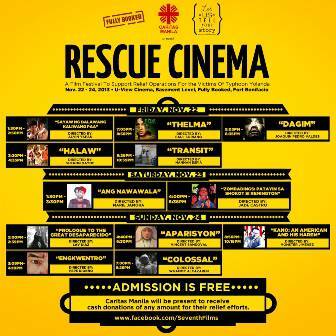 Twelve award-winning Filipino films will be shown at the U-View cinema at Fully Booked, aimed to raise funds for relief efforts. 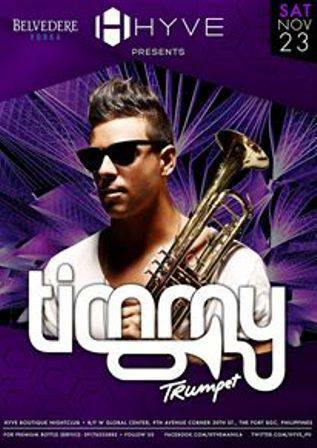 Why you should go: A unique music experience awaits you as acclaimed DJ and instrumentalist Timmy Trumpet performs at Hyve! Why you should go: This is a festival of arts for a cause! 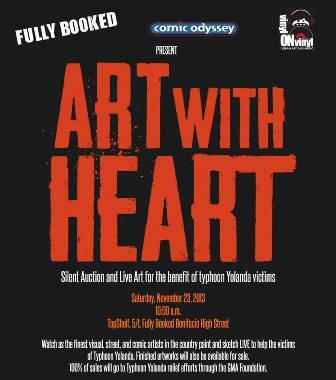 Visual, street, and comic artists will take part in the event. You can commission a sketch, purchase merchandise and art prints, or participate in a silent auction. Proceeds of the event go to Kapuso Foundation, to help in their relief efforts. Why you should go: Trade or buy or sell your LPs and 45s! Sellers include Tres Kuleros Records & Dry Goods, Blue Space, Vintage Expressions, Happy Dads Vinyl Shop, Tom's Vinyl Shack, Vinyl Depot, and more! While you're trading, enjoy the music by Tarsius, Pasta Groove, and other bands! Other details: Trading starts at 7 p.m. so be sure to come early to rummage through those crates! P150 gets you in with a free drink. Why you should go: Fifteen blues bands including Bleu Rascals, The Blue Rats, and The Brat Pack, will be playing to raise funds for the victims of the Visayas quake and Yolanda. 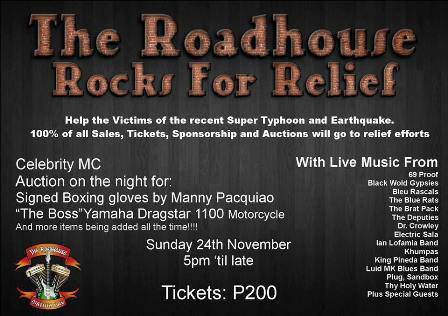 Signed boxing gloves from Manny Pacquiao and a Yamaha Dragstar 1100 will also be auctioned off! 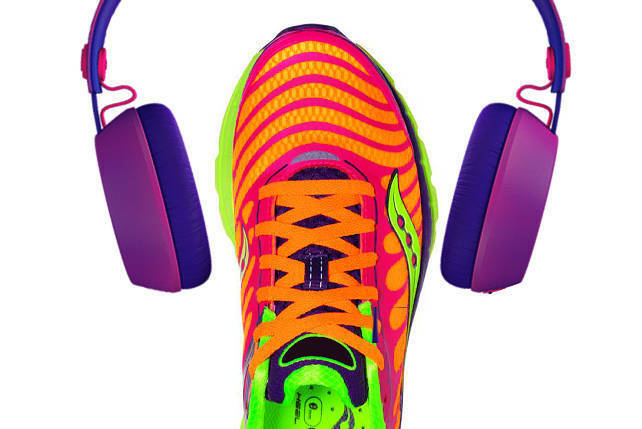 Proceeds of the auction will also go to relief efforts.